Crystal Fairy – Sebastian Silva’s feature debut stars Michael Cera (the adorable male ingénue from Juno and Superbad, though TV fans probably know him from Arrested Development) as Jamie, an American in Chile who has read Aldous Huxley’s essay on psychedelics, The Doors of Perception, and is intent on acquiring some San Pedro cactus, the native source of mescaline. He enlists his friend Champa in organizing a road trip with his two brothers (these three guys are played by the director’s actual brothers – Juan Andrés, José Miguel, and Agustin), and at a party the night before, loaded on too much booze and blow, he impulsively invites a wacky American girl who calls herself, yes, Crystal Fairy to join them. She is played by Gaby Hoffman, daughter of Warhol superstar Viva (of whom I’ve always been a big fan). The Look of Love – Michael Winterbottom’s latest also sounds like a fun romp, a flashy cinematic biopic about Paul Raymond, whose earnings from strip clubs, girlie shows and lad mags, wisely invested in real estate, made him the richest man in London. It is a lot more fun-fun than Crystal Fairy, but at heart it’s a serious, nearly tragic depiction of Raymond’s relationship with his daughter, Debbie, whom he grooms as his business partner and presumed successor (neglecting several other children to do so) only to watch her spiral into drug addiction and an early death. Although I don’t see everything and he’s very prolific, I’m pretty crazy about Winterbottom as a filmmaker. I love how he picks canny off-the-beaten-path subject matter, how he cycles restlessly through genres, and that he casts terrific actors (often Brits I’ve never heard of) and coaxes wonderful performances out of them. Steve Coogan is his go-to leading man, and he does a great job as Raymond, but the movie is full of yummy turns. I was most dazzled by Tamsin Egerton (below, with Winterbottom) as one of Raymond’s wives. Half the time you can’t believe the crazy things they’re saying and doing. It’s a harrowing and upsetting and extremely powerful film, really worth seeing and talking about. 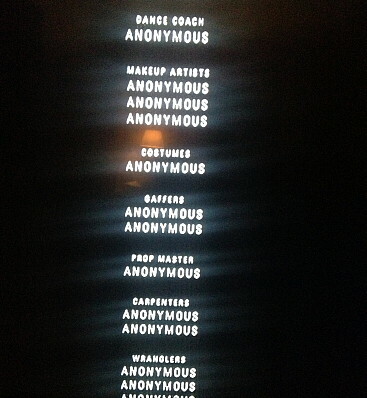 One of the most unnerving things about it is that when the credits roll, you notice that most of the production crew, for their own safety, are listed as “Anonymous,” including one of the co-producers. The website for the film provides some very interesting background information. 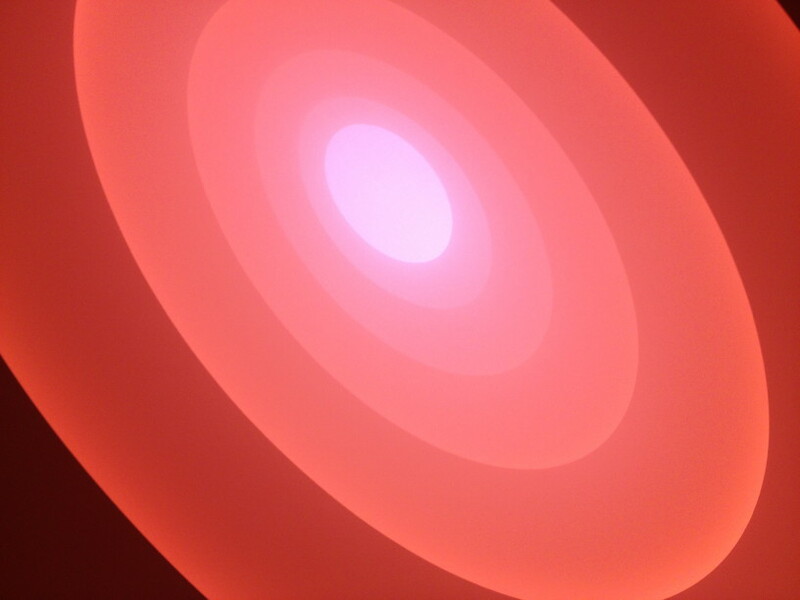 Last Friday morning Andy and I and Keith Hennessy’s boyfriend Adam Kuby (visiting from Portland for the day) made a pilgrimage to one of the blockbuster art shows of the moment, the James Turrell exhibit at the Guggenheim Museum. There was a long line to get in but it moved pretty quickly – we were in the door within 20 minutes, and shortly after that we were lying on our backs on the floor of the rotunda witnessing the main event of the show, a piece called Aten Reign. 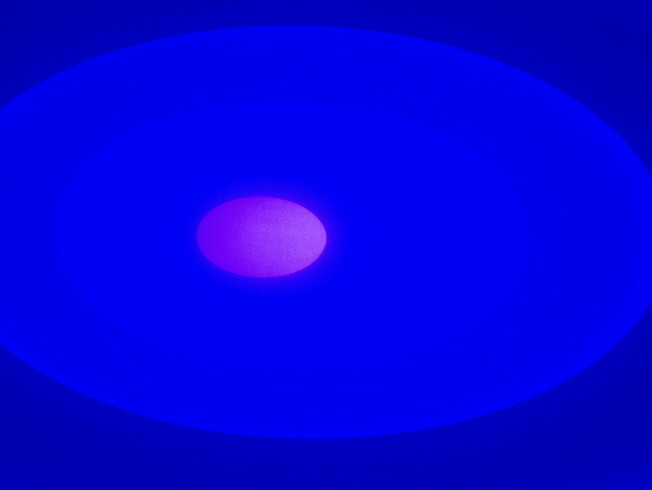 Turrell, a conceptual artist whose chief medium is light, has converted the Guggy’s famous spiral into a multi-tiered cone emanating concentric circles of gorgeous light continuously shifting color and intensity. Like everyone else, we had our smartphones out immediately to take pictures. It’s savvy marketing for the Guggenheim to encourage picture-taking AND it’s a cosmic joke for several reasons. 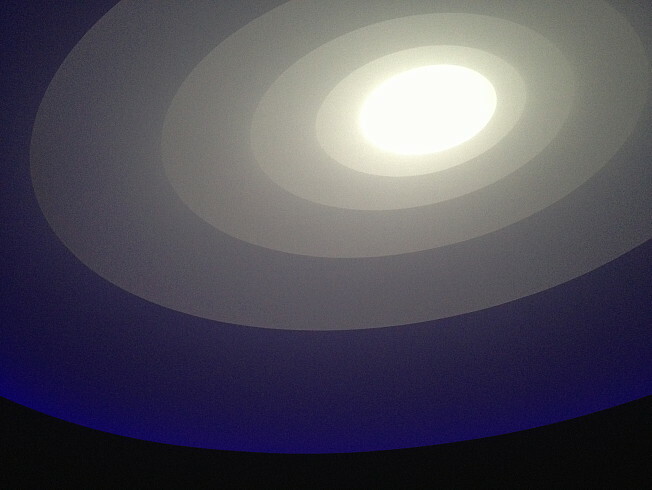 Turrell’s beautifully chosen lighting discombobulates your camera’s color-recognition capabilities. What you’re seeing never matches what your camera can capture. And even though you can get some gorgeous photos this way (check out my photodiary shots), it’s almost impossible to tell what you’re looking at because Turrell’s work toys so masterfully with dimension and flatness. It is, in a certain way, his one trick – making light simply projected onto flat surfaces look three-dimensional, or lighting depths in such a way as to make them look flat. (Is that two tricks or one?) The single example of the latter phenomenon on view at the Guggenheim, a piece called “Illtar,” is very very subtle and takes time to really perceive – and unfortunately it’s installed in a less than optimal manner. Although the room is small and the number of viewers limited, I could never get a purchase on it (after waiting on yet another line for half an hour to see it). Nevertheless, the Guggenheim show is a great opportunity to tap into an artist who’s sustained a deep original vision for a very long time. For a good overview, check out the New York Times Magazine’s recent profile of him. That evening, Adam and Andy and I had the pleasure of encountering another artist with a highly individualized vision cultivated over the course of several decades. When Karlheinz Stockhausen died in 2007, he had completed a magnum opus called Licht, a cycle in seven parts that takes 29 hours to perform in full. It is an elaborate, quirky mythopoeic “opera” with no singers in which each day of the week has its own color – just to mention a few of its eccentricities. The Lincoln Center Festival wisely bit off just a chunk of this giant work, a one-hour selection from Act II of Donnerstag aus Licht (“Thursday”) called Michaels Reise um die Erde (Michael’s Journey Around the Earth). 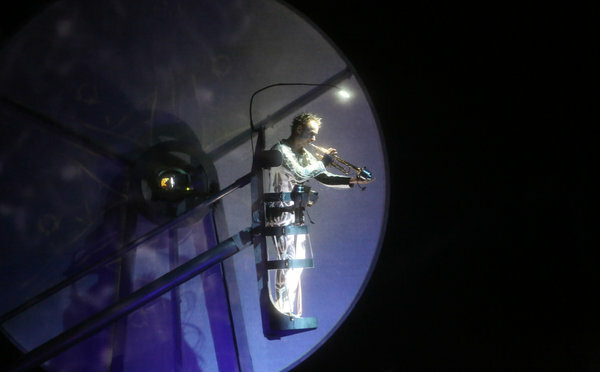 It was originally staged at Vienna’s Taschenoper by Carlus Padrissa, a member of the wildly adventurous Catalonian performance company La Fura dels Baus, featuring the Cologne-based Ensemble musikFabrik. Stockhausen’s score is characteristically modern, which is to say not especially melodic. Heavy on horns, it reminded me at times of some of Frank Zappa’s whimsical/lyrical classic compositions, and it was exquisitely played by the ensemble. Just by itself, it might have been a little dry to sit through, but Padrissa came up with an elaborate visual production with striking and witty projections, colorful costumes, and an amazing contraption for the trumpeter who plays the Archangel Michael – a kind of cage he’s strapped into that revolves him through space so at times he’s playing upside down. In the piece, Michael flies around the world making stops in Cologne, New York, Japan, Bali, India, Central Africa, and Jerusalem. The program notes mention the musical motifs that Stockhausen used to refer to these locations but they’re laughably glancing. There’s a lot to make fun of about Stockhausen – in his vision, Thursday is associated with the color blue, so the audience at Avery Fisher Hall was encouraged to wear bright blue clothing (they stopped short of issuing uniform smocks the way Park Avenue Armory did for the staging of Oktaphonie earlier this year) – but I admire his mind and his effort. Adam and I enjoyed the concert more than Andy, who chafed at the lack of melody to follow. 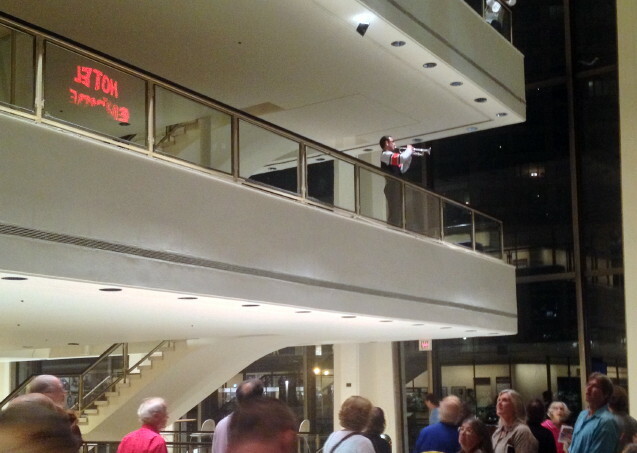 Departing the theater the audience was serenaded by five musicians playing a farewell piece from the balconies of Avery Fisher Hall (below) – a final lovely, quirky treat. The program notes, generous and informative, can be read online here. 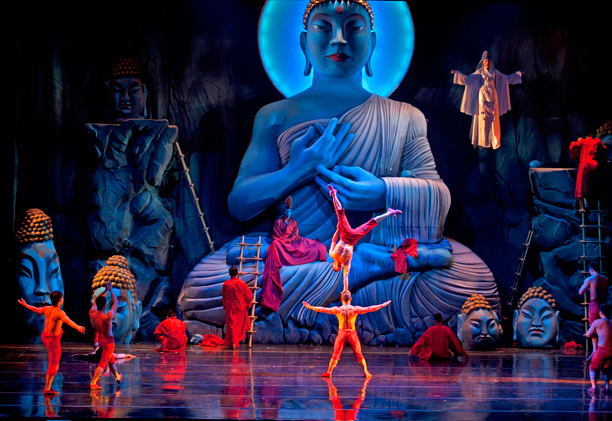 Lincoln Center Festival pitched Monkey: Journey to the West as a big deal, scheduling a whole month of performances. An adaptation of the classic Chinese novel Journey to the West, the show was directed by Chen Shi-Zheng, a youngish hotshot favorite of the festival, as a kind of rock and roll opera circus with music by Damon Albarn of the rock band Blur and visual design by Gorillaz (the virtual band Albarn co-created with Jamie Hewlett) and skills acts performed by the Jiangsu Yancheng Acrobatic Company. The still photos make it look amazing, but the show was unbelievably bad. Truly, one of the worst things I’ve seen in years. A smidgen of cool animation buried by lame staging, shallow spectacle, pathetically anemic acrobatics, underwhelming music — ugh. Festival kitsch. This entry was posted on	July 24, 2013 at 5:14 pm	and is filed under Culture Vulture.